Leon P. A. M. Claessens, Hanneke J. M. Meijer, Julian P. Hume, and Kenneth F. Rijsdijk (Editors) Society of Vertebrate Paleontology Memoir 15, Journal of Vertebrate Paleontology Vol. 35, Supplement to No. 6, 187 pages. 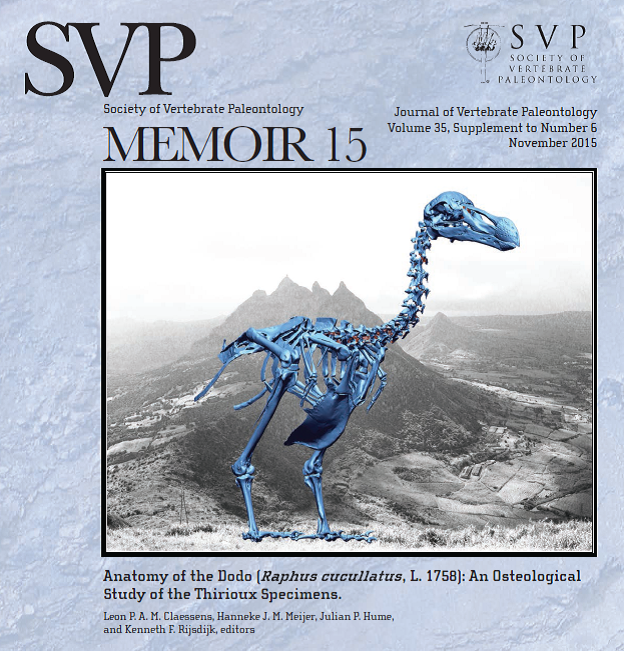 The new dodo monograph has been published online by the Journal of Vertebrate Paleontology. The 15th memoir issued by the Society of Vertebrate Paleontology describes the complete bone anatomy of the dodo, and shows its correct stature and gives insights into its behaviour. The morphological descriptions are preceded by a review on the ecosystem of the dodo using contextual information from a rich fossil deposition and paleoecolgical analyses (Rijsdijk et al., 2015). An official press release has been issued by Naturalis Biodiversity Center; a news item has been released by the University of Amsterdam (both in Dutch).